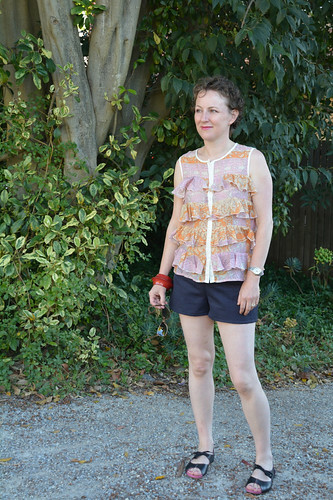 I made shorts… shorts people… I made myself a pair of Iris Shorts! Apart from two pairs of Anita Ponti pants, I’ve avoided sewing ‘bottoms’ for my entire sewing life. That’s five whole years readers. Silly I know, but the perceived fitting issues… well… they frightened me. I have a thick waist compared to my hips and this ensures my measurements are all over sizing charts. In this instance, my waist was a size 12 and my hips between a size 4 & 6. Yes, that’s quite a difference. I traced off a size 6 in the hips and graded to a 10 in the waist. The next step involved calico. I cut out and sewed up my traced pattern and even added the invisible zip (I need practice at those too!). The calico version fitted me much better than I expected, but the shorts were grabbing me… and not in a pleasant way… in the front crotch. I consulted “Pants For Real People” by Pati Palmer & Marta Alto and a RTW pair of shorts that fit me well and decided, rightly or wrongly, that my crotch issues were related to length as apposed to depth. The difference in the front crotch length of my RTW shorts and my newly stitched calico pair was 3/8″ (1cm) so I amended my traced pattern by that amount and cut out my fashion fabric. The fabric is a medium weight cotton, without any stretch, and the outside has a denim look that seems to have been achieved with some sort of coating. The fabric was purchased at Clear It (Alanah Hill) Outlet last year. The waistband facing is some cotton voile from my scraps tub. 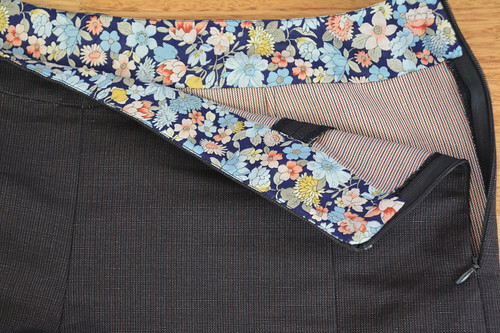 I eliminated the front pockets as I was keen to sew these up quickly as possible. 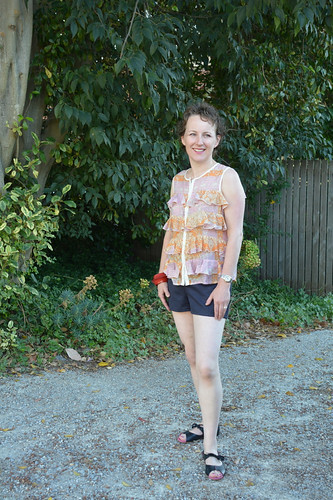 I also like my shorts short so I removed 2″ (5cm) from the length. The good news is the front crotch issue seemed to have been resolved. The not so good news is that I seem to have transferred my issues to the back. These shorts are for standing in only. Sitting or bending in them is… dare I say… very uncomfortable. Bummer! Accessories: Bangle by Sonia Rykel (brought here) & shoes purchased at Zomp. Bummer (literally). I have the opposite waist:hip ratio but equal lack of pants fitting knowledge. They look great standing up. Cocktail shorts perhaps? Bummer is such a good description! And I love the idea of cocktail shorts. I’ll be using that! I’m going to try some Japanese 3/4 linen pants next. Elastic waist… that’s got to make fitting easier! The Maritime Shorts might be my next try when it comes to pants… but there will be some dresses and tops before that to regain my confidence! Your ‘standing’ shorts look great; pity you can’t actually bend or sit in them! It seems lots of people have fitting issues with the Colette patterns so don’t be put off your shorts adventure. You might consider Grainline’s Maritime shorts. They have a very RTW look and make up beautifully. The lower waist might work well for your waist/hip ratio. I have the Maritime Shorts pattern and it will definitely be my next try when it comes to shorts. 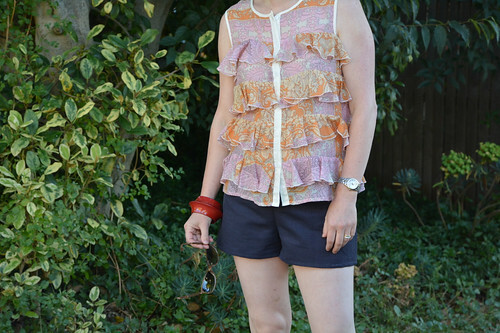 Knowing the Iris Shorts fit me in the hips and waist is a great confidence builder. I can see this is just the beginning of the journey and it’s actually exciting. I conquered FBA’s and I can do this too! Such beautifully stitched shorts and so sad they don’t fit! Drafting a pants block from first principles may be your best bet. Once you have one you can alter to suit whatever style you like. Getting one is not that easy of course. Where do you get your trousers/jeans from? Opening up an old pair might help a bit. My jeans are NYDJ leggings. I have a few old pairs, so yes, taking them apart might be a good start. Thanks for you advice. There aren’t too many things ore annoying than a wedgy… well actually there are, but it’s still up there. Even though this project didn’t have a happy ending, I haven’t been too traumatised, I will try again… one day. Heheh… well you got a nice amusing blog post out of it, at least 🙂 They do look great, so with any luck there’s not too much tweaking to make the pattern just right for you.